Reduce your fees, retire richer. See how you could save on fees. Check out our tool powered by FeeX. 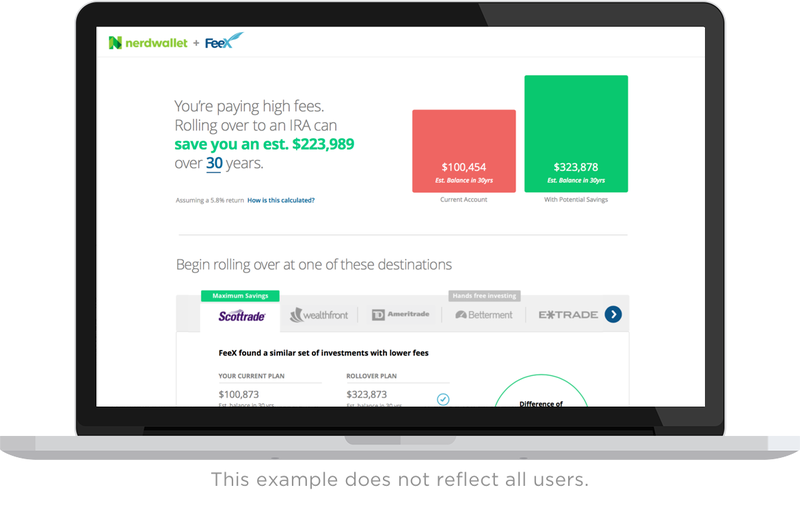 We teamed up with FeeX to help you find and reduce investment fees that could be costing you up to 1/3rd of your retirement savings. To quickly compare two funds, check out our Calculator below to see the long-term impact of fees. These fees can be substantial: over a lifetime, fees can cost a median-income two-earner family nearly $155,000 and consume nearly one-third of their investment returns. Do you have an old 401(k)? Detect hidden fees. Grow your retirement savings. A brief overview of investment fees. Brokerage account fees: These include annual fees to maintain a brokerage account, subscriptions for premium research to help with trading strategy, and fees to access trading platforms. Trade commissions: Charged by a broker when you buy or sell certain investments, such as stocks. Mutual fund transaction fees: Charged by a broker to buy and/or sell some mutual funds. Expense ratios: Annual fees charged by all mutual funds, index funds and exchange-traded funds, as a percentage of your investment in the fund. Sales loads: A sales charge or commission on some mutual funds, paid to the broker or salesperson who sold the fund. Management or advisory fees: Typically a percentage of assets under management, paid by an investor to a financial advisor or robo-advisor. 401(k) fees: Administrative fees to maintain the plan, often passed on to the plan participants by the employer.